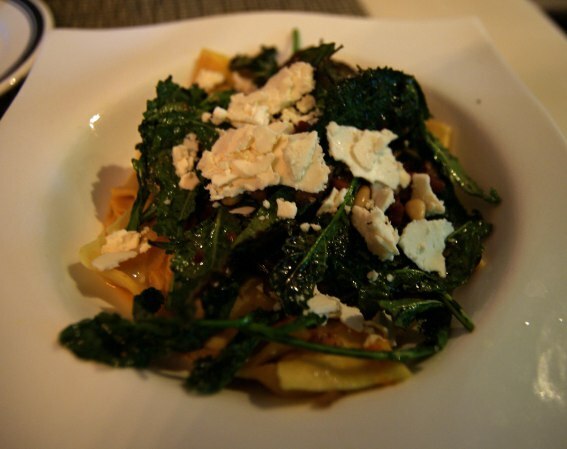 We recently traveled to the West side, and stopped at Luxe for dinner. Their focus is on smaller plates, with some pizza, salads, and sandwiches thrown in. They also have a decent selection of veg dishes. The restaurant is located in an old bar, and has some fun decor and just an all-around neat atmosphere. Personal preference, but I like eating in old, restored buildings vs. a brand new, shiny thing. 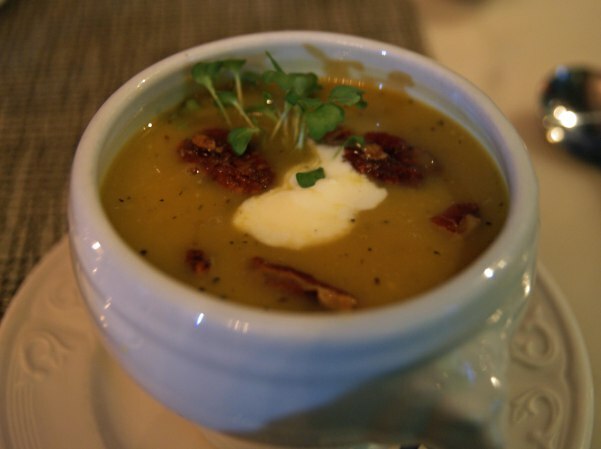 We started with a creamy winter squash soup, topped with candied pecans. Nice sweet, earthy flavor. 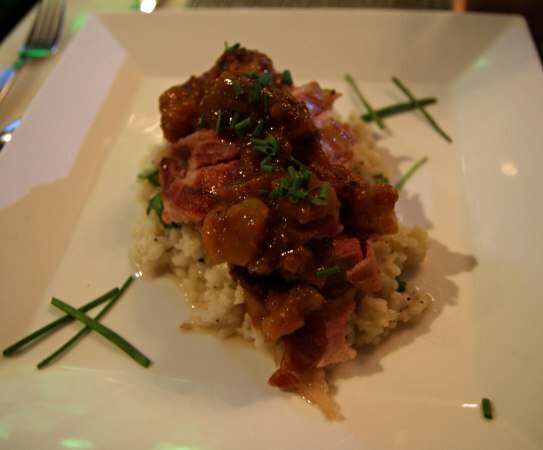 S tried a bacon-wrapped pork tenderloin with apple mostarda and Tallegio (cheese) risotto. Pork and apple is, of course, a lovely combination, and the bacon added another dimension that only bacon can. We love risottos, and this one was no exception. I went with a pumpkin agnolotti (kind of a short, wide noodle), complete with more bacon, braised kale, ricotta, and pine nuts. Since pumpkin isn’t really a strong flavor, it was overwhelmed a bit here, but overall it was a solid dish. Dessert was a bourbon-glazed oatmeal almond apple crisp, with a scoop of vanilla bean ice cream on top, and a strawberry for good measure. 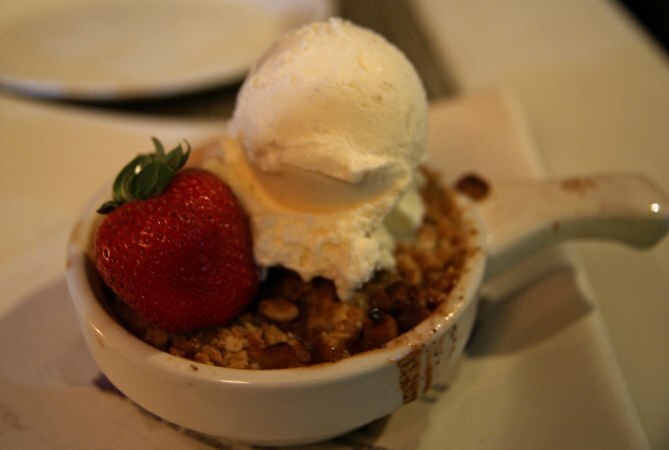 A good apple crisp is a perennial favorite – this one didn’t have anything extraordinary to distinguish it from others, but it was warm and sweet and well done, which is a good way to end a late fall meal. Verdict: Luxe gets five stars out of seven. Fun atmosphere (we got there early enough that it wasn’t too loud while we were eating, though by the time we left it was filling up a bit), very good food, nice service, and good prices. Stop by if you’re in the Gordon Square neighborhood!